Scooper - Technology News: What can governments learn from digital disruptors? Both the media and governments were empowered by the world of information scarcity. The rise of digital technology-enabled actors such as ISIS challenges the control of media that states once held exclusively during war. The distributed and disruptive nature of digital actors makes them tremendously difficult for hierarchical organizations such as states to counteract. The things that the state would need to do to shut them down would also harm a wide range of legitimate online activity, and run counter to the principles that drive Silicon Valley. Thus a 21st century state needs to be confident enough to give up some control in order to be a constructive player in the new digital world. For much of the 20th century, Western democratic nation states and the media coexisted within a mutually beneficial information ecosystem. In this world of information scarcity there were limited gatekeepers and captive audiences, meaning those with voices had concentrated power. This largely symbiotic relationship has been radically disrupted by the concurrent rise of digital technology and the social media ecosystem that it enabled. Nowhere is this challenge more acute than in the world of international affairs and conflict, where the rise of digitally native international actors has challenged the state’s dominance. Three moments demonstrate the scale of this shift. On 28 November 2010, WikiLeaks released the largest batch of classified material in history, and showed for the first time how information damaging to the nation state could be released without the filter of the media. While there has been important discussion about the scale of impact this act had, there is no denying that during the Arab Spring a range of individuals and groups were able to use social media platforms to both self-organize and broadcast to the world, requiring neither the filter nor structures of traditional media. 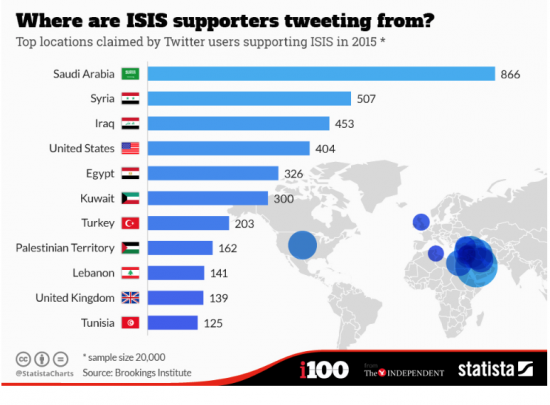 And more recently, groups such as ISIS have shown how social media can be used to build a global network of sympathetic followers and intimidate Western audiences with their brutality. War is about control of territory, beliefs and information. Each of these moments are indicative of how social media has transformed the space of war and undermined control of the information environment that states once possessed. “Disruption” has become one of Silicon Valley’s most popular, if cloying, buzzwords. While most often applied to companies such as Uber and AirBnB, in the international arena we are also seeing the rise of digital actors able to challenge the dominance of states and international organizations. Hackers, crisis mappers, citizen journalists, crypto-currency advocates, digital activists, whistle-blowers and terrorists all share four key disruptive attributes that confound the established powers. We are used to equating organization with control. The United Nations, Ford Motor Company, the U.S. military, the Red Cross: all gain power through their hierarchical structure. But in a networked model of power , groups can have agency and influence without formal structure. Participants can be anonymous, participation can be fluid, leadership is highly distributed and identities are derived from impact rather than institutional legacy. This new form of organization scares governments, so much so that they are willing to exert significant control over the network itself, as was revealed in the Snowden Documents about the NSA. Citizens of democratic states have given tremendous powers to government (the justice system, the social welfare state and the militaries which fight our wars) and to hold these powers to account we have put in place norms, systems of accountability and laws. For states seeking to fight new online powers, these norms of behaviour make functioning effectively online at best difficult, and at worst counter to the expectations and laws governing their activity. The very attributes of the internet that enable ISIS to communicate freely , WikiLeaks to release classified material and Silk Road to operate a black market also enable the free enterprise and expression that make it arguably the most liberating technology in human history. The risk governments face is that by seeking to stop perceived nefarious actors online, they will also shut down positive ones. Efforts by the NSA to break encryption, for example, won’t just help them fight illegal crypto-currencies or ISIS fighters using secure networking tools, they would also threaten the security of the online commerce sector and of activists who use encryption to escape state surveillance. Many of the actions that could help states counter groups like ISIS and WikiLeaks, (such as closing down user accounts en masse, great algorithmic screening of content, more collaboration with national security agencies) would be against the interest of many major innovators in Silicon Valley. Companies such as Facebook and Twitter are reluctant to shut down accounts because they would prefer to be viewed as a platform rather than a publisher. In addition, the business model that drives these companies is fuelled by data, so they have an interest in keeping participation dictated by proprietary algorithm, rather than editorial (or national security) judgment. Despite these challenges, governments could take steps to signal their constructive engagement online. First, states should seek to protect the network itself at all costs . This means, first and foremost, scaling back rapidly growing surveillance infrastructure and rethinking actions that threaten the very capacity of the online system, such as efforts to break encryption.It means having a serious conversation about the power and accountability of algorithms , and addressing dual-use technologies . Second, states should work with and learn from some disruptive digital actors, rather than seeking to shut them down. Instead of viewing the internet as a space to be controlled like a battlefield, states need to think about how they can employ the capabilities of some digital groups. While groups like Anonymous, Telecomix, or various block-chain networks do undermine traditional powers, they are also giving rise to exciting new forms of social organization, democratic process and the expression of rights. A 21st century state needs to be confident enough to give up some control in order to be a constructive player in the new digital world. 1. The distributed and disruptive nature of emergent digital actors makes them tremendously difficult for hierarchical organizations such as states to counteract. 2. Many of the things that states would need to do to shut down perceived nefarious digital actors (undermine encryption, expand government surveillance, etc.) would also harm a wide range of legitimate online activity and run counter to democratic principles that give states their legitimacy. 3. The current international institutional governance model (UN, ICC, Bretton Woods Institutions) was built by those who held power in the 20th century (states, multinational organizations, etc.). This is therefore disconnected from the groups and networks that increasingly have power now. Follow the author on Twitter @taylor_owen .